Gary L. Benton, a.k.a., "WR Benton"
Jim Griffin developed an interest in the frontier West, and particularly the Texas Rangers, at an early age. He grew to be an avid student and collector of Ranger artifacts, memorabilia, and other items. His collection is now housed in the Texas Ranger Hall of Fame and Museum in Waco.Jim's quest for authenticity in his writing has taken him to the famous Old West towns of Pecos, Deadwood, Cheyenne, Tombstone, and numerous others. While Jim's books are novels, he strives to keep his stories as accurate as possible within the realm of fiction. 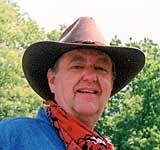 To that end, his good friend Texas Ranger Sergeant Jim Huggins, along with friends Karl Rehn and Penny Riggs, help him with the technical and historic aspects of his books. Melanie C. Benton, a.k.a., "Dahlia Patton"
Roy Frusha is a former Marine officer, Vietnam veteran, and high school English teacher. He served 24 years in the Louisiana State Police, during which time he completed DEA Basic and Advanced, Police Management from Northwestern University in Evanston, IL, and the prestigious FBI National Academy in Quantico, VA. He is the recipient of numerous awards, including the LSP Meritorious Service Award, Sons of the American Revolution Commendation Medal, and the Veterans of Foreign Wars Life Saving Medal. Frusha and his wife of 30 years reside in Lafayette, LA.